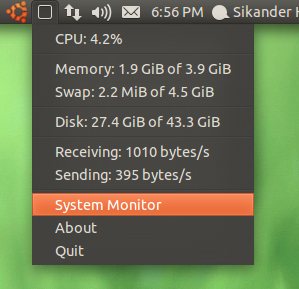 Syspeek yet is another hardware monitor AppIndicator intended for Unity. Currently, it works with Ubuntu Natty only. The icon load changes with every 10% increment of CPU load and at 100%, it turns bleeding red. 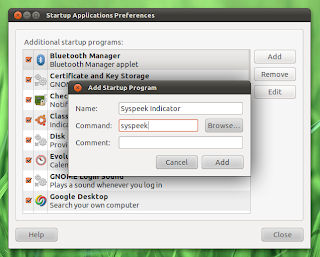 To make it start automatically when you boot your PC, press the <Super> key and search and open 'Startup Applications'. Click Add and type 'syspeek' in the command box as shown in the screenshot below.